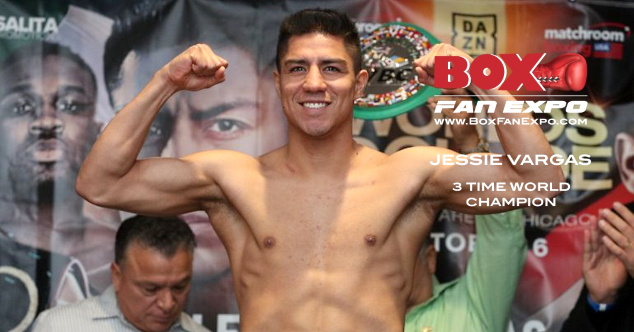 Three Time World Champion Jessie Vargas has confirmed that he will appear, have a booth and hold a Meet & Greet with his fans at the Las Vegas Convention Center for the fifth Annual Box Fan Expo on Saturday May 4, 2019 from 10am to 5pm, during Cinco De Mayo weekend. Vargas will make his fifth appearance at this years’ Expo and will be signing gloves, photos, personal items and also have his own brand of merchandise for sale. Boxing enthusiasts will have an opportunity to also take pictures with this fan friendly Boxing Star. Vargas last two competitive performances resulted in a draw versus top fighters Adrien Broner and Thomas Dulorme.